Hey all I just wanted to introduce you to a very special friend and family member of mine! Naomi will be doing several guest posts on my blog. Her articles will be focusing on wellness, eating with the seasons, and local food sourcing. Naomi resides in Wisconsin along with her husband, their two adorable Boston Terriers and a cat. I first became aware of the healthy and delicious practice of eating with the seasons when I spent six days cooking at an “agriturismo” near Tolfa, Italy several years ago. An agriturismo is a working farm and bed and breakfast inn, where guests are served gourmet local Italian cuisine, all certified organic, with the option of participating in cooking classes for all or part of your stay. , and I would highly recommend this property to anyone considering such a trip. One thing that I added to my seasonal eating routine the following year was joining a local CSA (Community Sustained Agriculture) farm. CSA’s are gaining in popularity and they are a great way to ensure that you will eat your veggies!! A CSA delivers a “share” of fresh herbs, fruits, and vegetables weekly or biweekly to a local host site, for 20-22 weeks of the harvest season. The CSA that my family belongs to (Good Earth Farms in Oakfield) sends out weekly newsletters with tips, recipes and ideas on ways to use that weeks’ produce, or how to preserve it for later use. Just this spring, Good Earth Farms officially received their organic certification. This year I was fortunate to apply in time to be considered for a “worker share” at Good Earth Farms CSA. For a four-hour shift weekly for a minimum of twenty weeks, I go to the farm and help with whatever work needs to be done depending on the weather and the crops. This could be transplanting seedlings; harvesting; washing; counting and weighing produce; and LOTS of weeding by hand. This experience, although I am only 8 weeks into it, has really fueled my desire to learn more about eating with the seasons, local sourcing, and the benefits of organic food and household products. 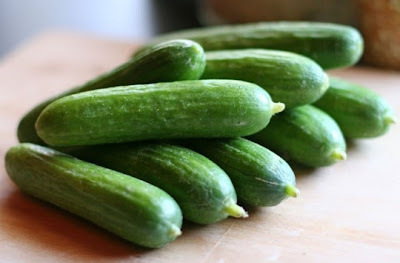 Right now the “hot crops” seem to be cucumbers, green beans, and zucchini. Following are some recipes and ideas of how to enjoy each of these wonderful green vegetables now during peak season, as well as ideas on how you can plan ahead to enjoy a taste of summer in the midst of a frigid Wisconsin winter. Buen Appetito! Note: 1/4 cup is only 16 calories! In a small bowl, combine the first six ingredients. In another bowl, combine the sour cream, lemon juice, lime juice, cumin and seasoned salt. Pour over cucumber mixture and toss gently to coat. Serve immediately. NOTE: As this salsa sits, it gets runnier over time. If you find you have a lot of “juice” left and not many veggies, add more chopped cucumbers and tomatoes and a little more sour cream to thicken. Our family's favorite way to eat green beans is roasted... Wash beans, cut off ends only. Spread out on a large cookie or baking sheet. Sprinkle with garlic powder; kosher salt or RealSalt; freshly ground black pepper. Drizzle EVOO (extra virgin olive oil) over beans. Coat the EVOO/Seasonings on to the beans evenly and spread out evenly on the pan... I usually do 3 lbs and it takes 2 large cookie sheets, and serves 4-6. Place in oven preheated to 450 degrees. After about ten minutes, stir and turn them to keep from browning too much. Roast for about another 10-12 minutes until somewhat browned and crisped. Ever since my niece showed me this way to do green beans, our whole family has been IN LOVE with doing many vegetables this same way, from asparagus spears to peppers, mushrooms and onions. The beans are so delicious we call them string bean candy!! They are even good cold the next day when fixed like this. Refrigerate fresh beans in a plastic bag, and use beans as soon as possible, for they are quite perishable. Green beans will keep well for up to a week. Fresh beans are easily frozen for long-term storage. Trim off ends only, and either keep whole or cut into 1-2” cut green beans. Blanch in boiling water 2-3 minutes, rinse immediately in ice cold water, drain, dry well, and pack into airtight containers. 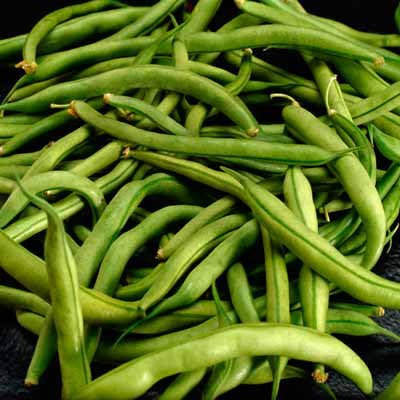 If you have the freezer space, you can put away enough green beans to last you through the winter. Remember when the only way you knew how to use up those zucchini (summer squashes) was to shred them and make Zucchini Bread or Zucchini Muffins? The popularity of this very nutritious and unbelievably easy to grow (you just need SPACE!!) vegetable has skyrocketed in the last two decades. You can find unlimited ways to use this versatile vegetable, from using it in place of pasta on low-carb diets, to sautéing it in omelets, stir-fry recipes, or oven roasted vegetables. Cook zucchini and onion in EVOO until tender (about 8 minutes). Stir in spices. Blend eggs and cheese and stir into vegetable mixture. Separate crescent rolls (or use prepared pie crust) and spread into 12x8 or pie dish---up sides. Spread crust with mustard; then add the vegetable/egg mixture. Bake at 375 degrees (18-22 minutes). Knife in center should come out clean.